For the second consecutive year I directed and designed the CDW Merchants trade show booth for GlobalShop 2016 with a team of industrial & graphic designers. CDW Merchants is a leading provider for 3D visual retail displays & e-commerce packaging for the North American market. The GlobalShop is the biggest trade show in the USA that combines retail design, merchandising, shopper facing technology and marketing. There is a clear tendency among props and décor companies to consistently showcase the habitual holiday theme and seasons at GlobalShop year after year. I saw clearly an opportunity for CDW Merchants to change their client’s perception of them as just being a props supplier and more like a company that understands today’s trends and demands in the retail industry. 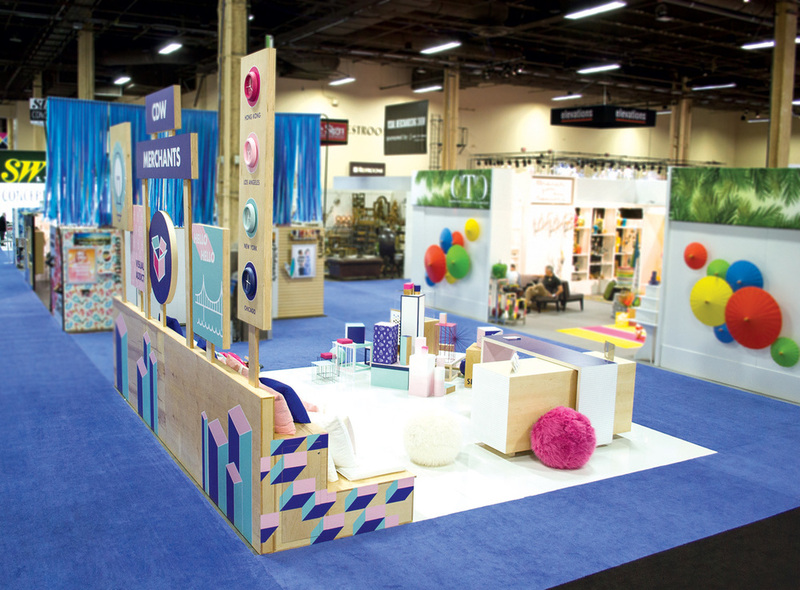 The creative direction for the booth this year positioned CDW Merchants as an anomaly among a sea of sameness. Using this idea I created a booth that was bold yet simple. It became a welcoming sight to attendees as visually pleasing and exciting place to stop by to escape the overwhelming neighboring booths. The signs have been designed to be part of the concept language and in some cases replaced words to create pictogram stories. Each sign reflected CDW Merchants’ unique and best qualities. The light bulb and the open box expressed their strong creative thinking and ability to take on any challenge while the bridge symbolized CDW Merchant as being a connection between the client and the vendor. Even the logo was streamlined to feel more contemporary and align with the bold simplicity concept. The open space configuration created a welcoming and approachable environment by allowing guests to enter from any direction. 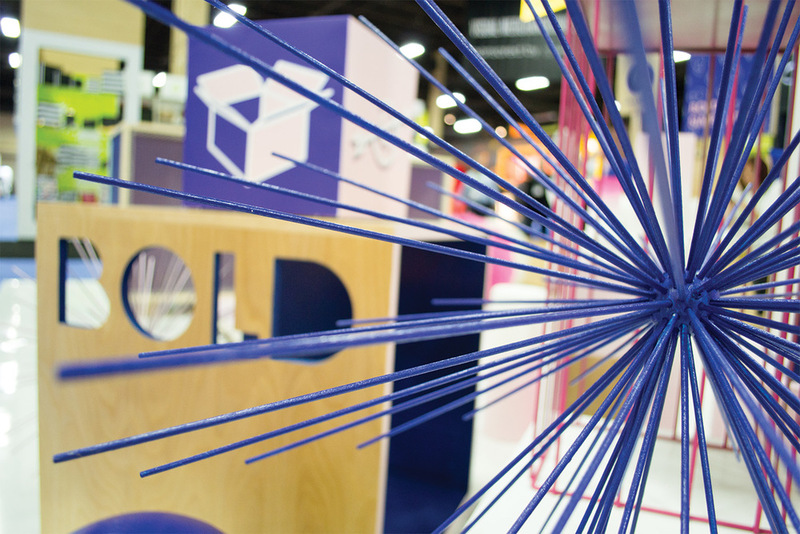 The use of raw plywood, peg boards and mesh brought a youthful and edgy look to the booth. The stadium seating and the table were the two main areas designed for personal interaction. The table was designed to have standing conversations on the go while the stadium seating allowed the guests to comfortably sit down and engage in more in-depth conversations. To further emphasize CDW Merchant’s core capabilities of building custom fixtures I created a collection of unique modular risers inspired from playful building blocks. The risers allowed the guests to re-arrange the displays leaving a personal imprint while still remaining visually consistent in any combination. Using what I learned from the previous year’s booth and consideration for current year I developed two concepts through sketches and mood boards. I then created a miniature model that visualized the space and potential of the design. 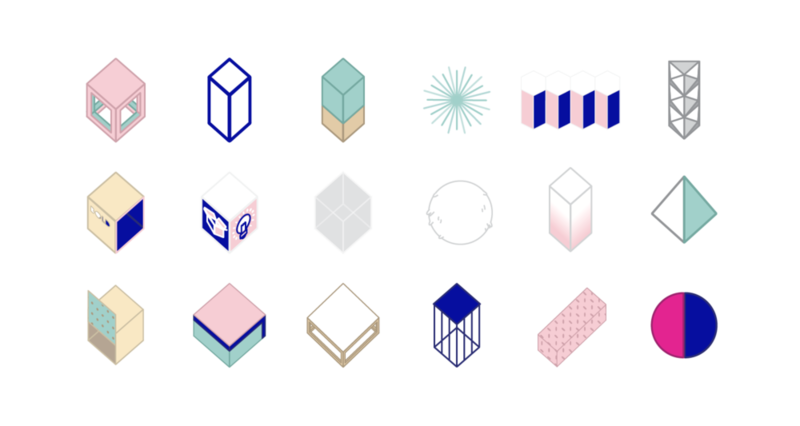 Working close with a team of industrial and graphic designers we developed renderings and visuals for each of the elements. We then worked with a LA based workshop that built the booth. Due to the smart nesting booth design and practical engineering components we saved in shipping costs and installation time. The design of the booth was a radical change for CDW Merchants and had a positive effect on their guests who enjoyed coming back multiple times during the day and mingling with the sales team. It brought a new and fresh vibe that reinvigorated the brand and was also a good representation of CDW Merchants capabilities. The booth won the “Outstanding Booth Award” from VMSD magazine and press recognition. 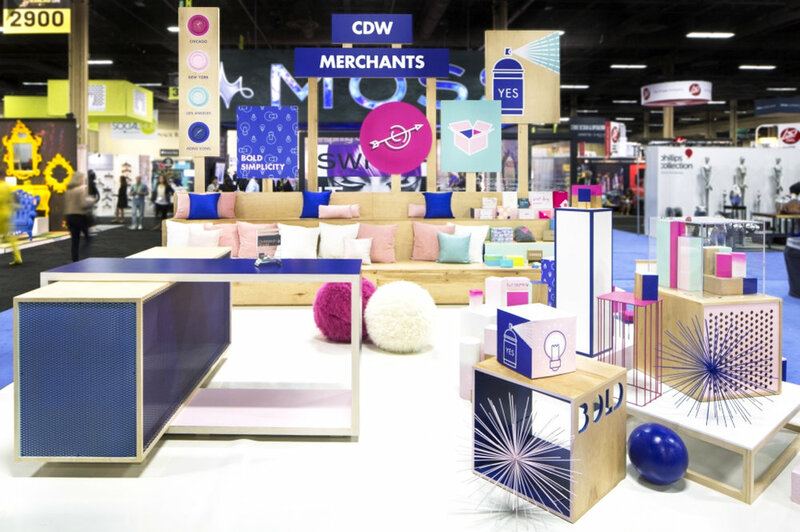 "They (CDW Merchants) followed the retail principles of a good store design in their booth: on-trend materials and colors, the option to meet-and-greet with the booth designer, social media buzz, millennial appeal and intuitive brochures – all speaking the same brand language. Winner!"